My artworks are autobiographical narratives. The images are figurative and gestural, and are deceptively simple metaphors of human experience. They are joyous and whimsical, emotional and poignant. They represent an optimistic and naïve spirit embracing the moments that make up my life. 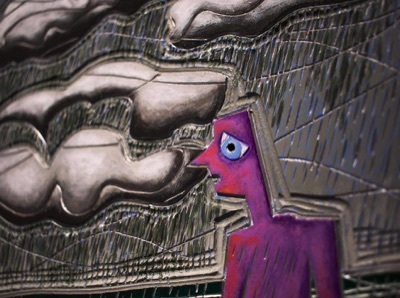 These bas reliefs are created by carving and painting linoleum. (It is the same kind one would use to create linoleum block prints.) It is my intent by doing so to add a sense of sculptural depth to the paintings. It is for this same reason that I choose to frame these carvings in shadow boxes that enhance the "object-ness" of the carvings. I like that they have weight and mass.